Three new LG Android smartphones designed to be appealing to the style-conscious users are soon expected to hit the market. First seen just before MWC 2012, the three models are the LG Optimus L3, the LG Optimus L5 and the LG Optimus L7. The latter is the high-end model of the trio, with a dual-core 1GHz processor under the hood. The 4.3 inch WVGA IPS display has pixel density of 217 ppi and features LG's "floating mass display". Like the screen on the LG Optimus Black, this simply means that the display is placed closer to the surface of the phone which leaves the impression that the display is floating. 4GB of native storage is on board although the microSD slot can bump that up. There is a 5MP rear-facing camera with AF and LED flash. Despite having 512MB of RAM, the LG Optimus L7 will have Android 4.0 installed out of the box (hear that, Motorola?) with LG's 3.0 UI skin running over it. This model is expected to launch in Europe later this month for 319 EUR which is approximately $420 USD. 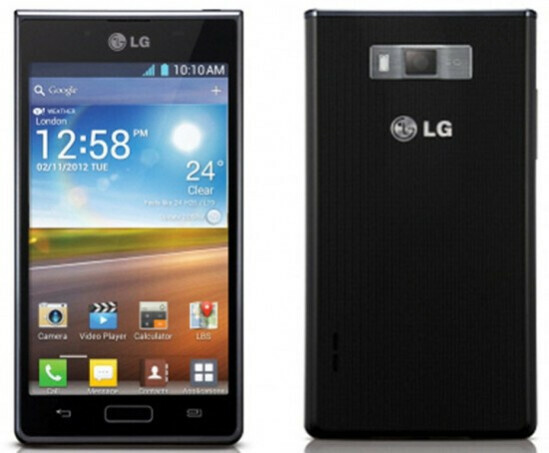 Expected out next month is the LG Optimus L5. This unit carries a 4 inch display with resolution of 320 x 480 and has a pixel density of just 144 ppi. Powering the model is a single-core 800MHz processor and a 5MP camera with an LED flash on the back. Guess what? Despite having what you would consider low-end specs, this phone will launch with Ice Cream Sandwich aboard. This leaves the LG Optimus L3 is an entry-level smartphone equipped with a 3.2 inch TFT display with resolution of 240 x 320 and pixel density of just 125 ppi. A single-core Qualcomm MSM 7225A 800MHz processor is running the show and there is 384MB on board. A 3.2MB camera on back captures video at 480p. 1GB of native storage comes with the unit, but can be expanded by using the microSD slot. Is Ice Cream Sandwich installed on this model? According to Android Community, the answer is in the affirmative. There is no word on when we will see this handset launched. The Korean based manufacturer says that the L-Series will have 5 special design features. First, the handsets will be square to make them easier to grip. They will offer the "floating mass screen" for a slim look, a more intuitive set-up of menu keys, metallic accents and a thin design. sony is the best when it comes to midrange and lowend phones, they pack them with tons of features and a modest 1ghZ snapdragon soc with adreno 205, which can even run shadowgun!!! (smoothly), lesson learnt sony, now its time for LG. I agree with cyan3bon.However,I think you should stay away from the L3 and L5.Their poor ppi is the reason. Get a galaxy mini 2,unless you are only concenered on beauty and cost. Exterior seems legit, but the internal specs for me are a nightmare.... I don't mind a 4.3" screen, but LG sud really consider qHD or HD screens if they're planning on releasing them later this yr, esp for the L7, rather than a WVGA screen... The 217ppi pixel density is just not acceptable if rumor holds true, and needs at least a 1.2/1.5GHz dual-core processor with at least 1GB of RAM and a 8MP camera if LG's planning on pushing the L7 as their flagship-like smartphone... If the article holds true, then it'll be a smart move by LG to at least have ICS preinstalled and a microSD slot. Samsung is the 'Copycat'...and you? Copycat's fan? 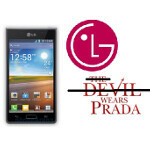 lg reworked their skin so it is great now as far as i could see it..
Why choose a stupid name Prada? Selling Phone or selling BAGS?? May have used the wrong Ox Skin??? I think It's too late to launch a high end smart phone with 512 MB of RAM. 1 GB of RAM should be a standard for next android phone having 1 GHz of CPU. I cannot use browser to browse any huge webpage without force close in Nexus S in spite of the fact that the RAM has been clear.